Designed for the horseman, Burlington’s Hackney sock is an extra long Argyle pattern sock for wear with riding boots, including specific ankle, heel and sole support padding for added comfort while on horseback. 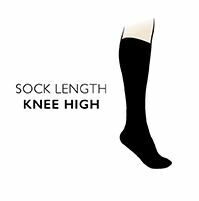 The leg is unpadded, allowing for greater flexibility in closefitting boots, with a long ribbed cuff, while the hand linked toes for smooth seams offers greater comfort, avoiding abrasion and irritation on long rides. As with all Burlington socks, the Hackney features the famous metal Burlington button on the leg of one sock.